A Republican in Congress is looking to block 70,000 federal employees from unionizing, introducing a bill to ban organized labor at the Internal Revenue Service. The Preventing Unionization of Revenue Service Employees, or PULSE, Act (H.R. 6268), introduced by Rep. Paul Gosar, R-Ariz., would specifically exclude IRS employees from provisions of Title Five of the U.S. Code related to labor-management relations. That would effectively prohibit employees at the unions from unionizing or engaging in collective bargaining. The National Treasury Employees Union currently represents nearly all IRS employees. Gosar said his bill would piggyback on a recent Supreme Court decision that ruled public sector unions could not collect mandatory fees from non-members. The ruling would not apply to federal employee unions, which were already banned from collecting such fees. “In line with this major win for the American taxpayer, my legislation would be a check against partisanship and union abuse, specifically at the IRS, and would help ensure that the employees within the agency enforce the law with integrity and fairness,” Gosar said. Gosar introduced a similar bill in 2015 with 24 cosponsors, but it never received a vote. The congressman noted other federal agencies, such as the National Security Agency and FBI, impose bans on unions. Gosar was referring to a practice known as official time, which allows federal employees to conduct representational activity while on the clock in their federal jobs. Official time is codified in law, but the extent to which it is allowed varies by agency and is typically negotiated in collective bargaining agreements. Internal union activity, such as solicitation of membership, elections of officials and collection of dues, is prohibited. In fiscal 2016, the most recent year for which data is available, Treasury Department employees received about $22 million in salary and benefits to spend 482,000 hours on official time. 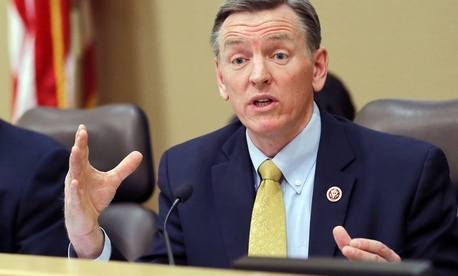 Gosar’s measure continues the targeting of federal employee unions in recent months. In May, President Trump issued multiple executive orders aimed at crippling the labor groups. One was aimed at reining in the use of official time, while another would limit unions’ negotiating power during collective bargaining. Trump directed agencies to renegotiate agreements over the next year to strip out “wasteful” provisions. "Like the president’s anti-labor executive orders, this is just another effort to deny working men and women basic rights in the workplace," said NTEU President Tony Reardon. "Over the years, NTEU and the IRS have made improvements at IRS workplaces that make the agency more efficient and assisted more taxpayers. After losing 22,000 employees in the last eight years and $700 million in funding, what the IRS really needs is more staff and resources to better serve the American public."